Professor’s ‘Funky Fizix in Fi..
As the fall 2017 semester is coming to an end, students are buckling down while finding fun ways to de-stress before final exams arrive. Whether it’s melodically engaging his audience, presenting classic card tricks or simply finding an excuse to take a break from studying to have a good time, one MTSU sophomore can do it all. 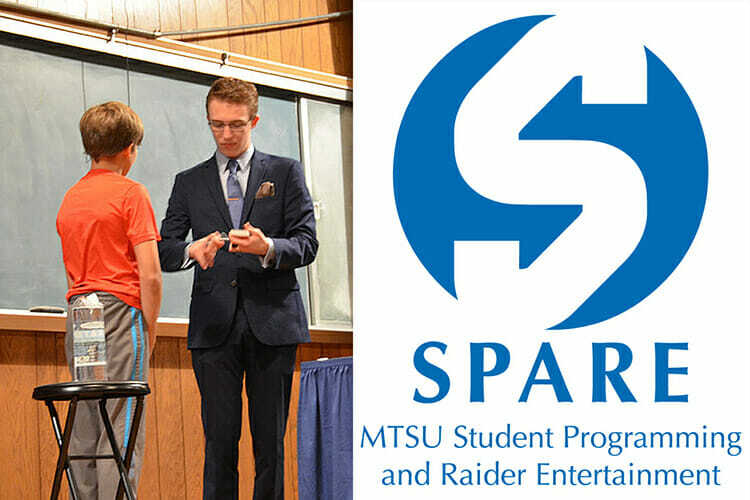 Families and students were invited to participate in a highly interactive magic show Nov. 16 in the Keathley University Center Theater to discover a few magical wonders with MTSU Student Ambassador Austin Ford. Sponsored by MTSU’s Student Programming and Raider Entertainment, also known as MT SPARE, the show not only gave the Georgia native a chance to sneak away from the books for a moment, but also to present a “wow” experience to a crowd of excited spectators for free. No worries if you missed the first show as Ford will be giving an encore performance at 7 p.m. Thursday, Nov. 30, in the same location. Ford, who has practiced magic since he was 15, said sometimes the stresses of studying and making sure his grades are in tip-top shape can encourage students like him to dive into extracurricular activities during their time in college. “It’s a mixed bag — it’s difficult work to do it well, but I enjoy it immensely,” he said. And the amateur magician doesn’t have plans to stop doing what he loves anytime soon. His show features a variety of card tricks, sleights of hand and even some piano playing as part of the entertainment. A break from pre-final jitters is always something to look forward to, said MTSU staff member Lisa Schrader, who shared some tips on how to avoid being overwhelmed. “Find time to do things you enjoy with doing whatever your hobby is — give yourself permission to do that,” said Schrader, director of MTSU Health Promotion in Student Health Services. She even provided some advice if you feel yourself panicking while taking a test. “I would recommend deep breathing and taking a moment at your desk to breathe in slowly, hold it, and exhale … do that for a few cycles so you begin focusing on the breathing and not what your stressor is in that moment,” she said. MT SPARE also holds an event titled “Exam Jam” that will begin at 9 p.m. Thursday, Dec. 7, at McCallie Dining Hall behind Corlew Hall. It’s a way for students to relax and enjoy tasty breakfast foods and games before final exams. For more information about MT SPARE, visit https://www.mtsu.edu/events/index.php.